Things become much more simplified at the end of the spiritual search... so much so that it's possible to identify key stages that every seeker encounters immediately preceeding awakening (enlightenment). 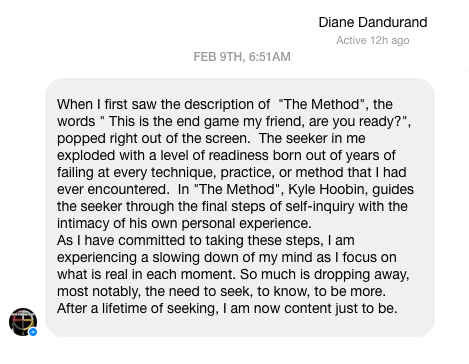 So in one sense, these 5 steps have not been invented by me, I have simply segmented the final stages that a seeker of truth encounters when they have reached the end of the spiritual search (for greater clarity and guidance). 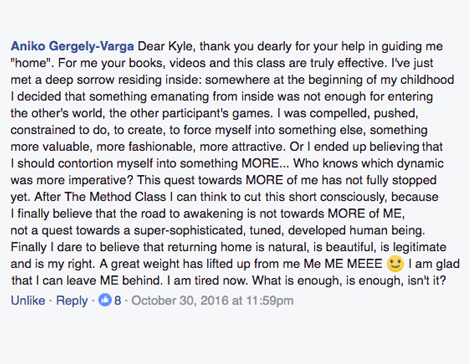 If you’ve been on the spiritual path long enough, you’ve probably reached the conclusion that no technique or practice can wake you up, make you free, or make you enlightened. You will have likely realized that all effort to attain a different state of consciousness can only ever come from a delusional state of consciousness, or false self. So what does one do then when one realizes such a thing? If there’s nothing that you can do to set yourself free, then how do you become free? Enter the 5 final steps of self-inquiry. The Method is based upon the understanding that spiritual awakening is not an attainment, but a dissolution. These 5 steps are intended to permanently dissolve the deeply ingrained belief that you can *make* yourself free. If these steps are followed through with utter totality, awakening will be what's left as a byproduct. While no methods 'work' when it comes to awakening, all methods fail... so in a way, any method can be helpful to exhaust the seeker in you. This method has been formed specifically for those who have tried every other method under the sun and are ready for defeat. This method is intended to be the last method. If you feel you're ready for these steps, only one requirement will be asked of you (aside from the class fee): totality. Your 100% commitment to taking these steps with every last ounce of energy you have is all that I ask. These steps won't work to dissolve the seeker if you're not total in them. This is the end game my friend, are you ready? Please Note: A class PDF outline will also be included with the Video recording so that you can familiarize yourself with the steps before watching.